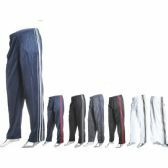 If you are looking for the best wholesale deals on men’s sweatpants, tracksuit bottoms, and athletic jogging pants, then look no further, because we have the biggest discounts on bulk cases of wholesale sweatpants for men here at Wholesale Sock Deals. 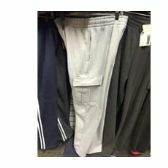 Whether you are a buyer for charity, school or church appeal, or you are buying stocks or a retail store, we have some amazing bargains for you on a wide range of inexpensive high-quality men’s sweatpants. We have men’s lightweight joggers at incredibly low wholesale prices, we have huge bulk discounts on tracksuit pants, zipper pants, and fleece sweatpants, and we have the lowest discounted wholesale prices right across our entire range of men’s training pants and track pants. 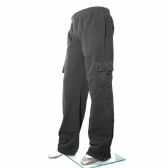 Good quality sweatpants at low discounted prices make a great purchase for a men’s fashion store or a discount store, and fleece men’s sweatpants make a good purchase for charities like the American Red Cross, a church, and the Salvation Army to give out to those in need of warm pair of pants for the winter too. Sweatpants and track-suit bottoms are not just for the gym, a sports team, or for athletes warming up, sweatpants are a fashion item as well, so there will always be a high demand for good quality, low-cost men’s sweatpants. Don’t miss out on this chance to get the biggest discounts on bulk cases of wholesale men’s sweatpants. Place your bulk order for high-quality men’s sweat pants at low wholesale prices from Wholesale Sock Deals now and start saving money today! 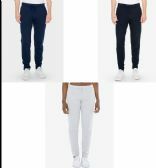 You won’t find prices as low as this on wholesale men’s sweat pants anywhere else, so don’t delay, order your bulk cases of inexpensive sweat pants and track suit bottoms for men now and grab yourself a wholesale bargain. You will find huge wholesale discounts on men’s training pants, zipper pants, jogging pants, track suit pants and track suit bottoms here at Wholesale Sock Deals, so stock your retail store or charity warehouse with the best quality men’s sweat pants at the lowest wholesale prices. 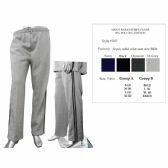 If you own a retail store, then take a good look at our low wholesale prices on men’s fashion track pants, heather gray sweat pants and men’s cargo sweat pants. 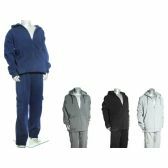 If you are buying clothes for a charity like the Salvation Army, the American Red Cross, or a church or school appeal, then our wide range of winter warm fleece pants would be an ideal donation to help support those in need of some warm clothes. 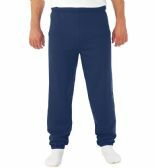 Wholesale Sock Deals is the number one supplier of low-cost wholesale sweatpants, socks and winter clothing to retailers and charities, so stock up your store today with best quality men’s sweat pants and track pants at the lowest wholesale prices. Men’s athletic pants like these make great casual wear pants and they be worn for jogging, warming up and in the gym as well. There’s always going to be someone looking for a good pair of men’s sweat pants! 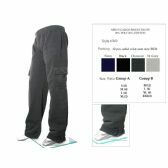 We will deliver your wholesale men’s track pants and sweat pants free of delivery charge, so place your order now, and get ready to stock up your shelves with a great range low-cost men’s sweat pants at the lowest wholesale prices!